Here at Grub we thought it’s about time we started sharing some of our cooking techniques with you. We’ve been busy in the kitchen and our chef has put together some basic cooking guidelines to help you guys get creative in the kitchen. The beauty of cooking with insects is just how versatile they are as ingredients. They can be puréed, roasted, fried, poached, turned into salts & flours, caramelised and even eaten raw (if you’re into that kind of thing?). There are infinite ways to highlight the true deliciousness of insects and here at Grub we aim to help you get the most out of them in the kitchen. So here is today’s lesson, roasting. Each and every insect within the Grub product range tastes awesome after roasting. They take on flavour with ease, whilst still retaining their own individual taste. 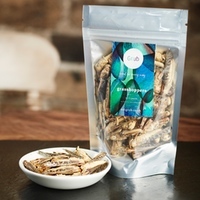 For example crickets taste a little like milky nuts, buffalo worms like nutty shrimps. Due to the size and delicate nature of insects as a food product, they need to be roasted carefully to avoid over cooking. Most insects go black and taste bitter when overcooked, not too dissimilar to nuts. Here at Grub we find the most effective and simple way to roast insects is to lightly coat them in soy sauce and wrap them in tin foil. Roast within the foil to begin and then open up and finish them off with direct heat. This essentially steams the soy sauce around the insects and then finishes them with a crisp before eating. Pre-heat oven to 180 degrees centigrade then place the soy coated crickets, wrapped in tin foil on the top shelf for 10 minutes. Next open up the tin foil and give the insects a shake to stop from sticking. Place back in the oven for another 3-5 minutes until all are dry, golden brown, fragrant and crispy. Pre-heat oven to 180 degrees centigrade. Remove the legs and wings and then coat in soy sauce and wrap in tin foil. Place on top shelf of oven and cook for 12 minutes. Next open up the tin foil and give the insects a shake to make sure they’re not sticking. Place back in the oven for a further 3-5 minutes until they are all dry, golden brown, fragrant and crispy. Pre-heat oven to 160 degrees centigrade and place the soy coated worms in tin foil for 10 minutes. Next open up the tin foil and give the worms a shake to make sure they are not sticking. Place back in the oven for a further 3-5 minutes until they are all dry, fragrant and crispy. These are also very tasty if you bruise a few garlic cloves and roast it with the meal worms. Pre- heat oven to 160 degrees centigrade and place the soy coated worms in tin foil for 8 minutes. Next open up the tin foil and give the worms a shake to make sure they are not sticking. Place back in the oven for a further 2-5 minutes until they are all dry, fragrant and crispy. These are also very tasty if you bruise a few garlic cloves and roast it with the buffalo worms. We recommend that you try all of the insects and explore your way around them. Roasting them in such a simple way allows for you to taste each insects unique flavour, the soy additive purely enhances this flavour. Still keeping it simple, there are many other things you can add to these insects which are all worth a try. A sprinkle of toasted ground white peppercorns, paprika and smoky dried chilli powder really makes for an awesome snack (goes great enjoyed with a couple of beers). Another personal favourite of mine is to sprinkle them with peanuts into a salad, just to mention one I use coriander, mint, Thai shallots, roasted rice, fish sauce, lime juice and a little caster sugar. This dish is also great if you add crispy pork belly, buffalo worms especially compliment the pork. Anyway that’s enough from us today and please do get in touch if you have any questions for us. Also keep your eyes peeled for more cooking tips straight out of Grub’s kitchen from chef Sebby Holmes.